This 31 acre rocky island is currently owned and managed byThe Nature Conservancy. Well known for its spectacular spring wildlflower displays, the island is open to visitors daily from 10:00 AM to 4:00 PM. The TNC has done a very good job at maintaining this remmnant Puget Prairie system. 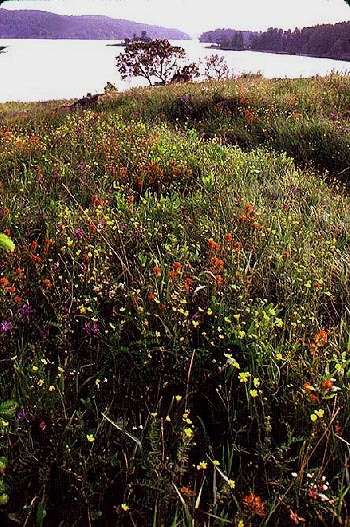 Best time to see the mixed wildflower bloom (Fawn lilies, Camas, Indian paintbrush, Chocolate lilies, Buttercups, etc.) is from mid-April to early May. Boat access only. Keep to marked trails. Please check-in with the resident caretaker upon arrival. Groups larger than 6 persons require advance approval from Seattle TNC office. This is an ecological research area, no camping or picnics allowed.